Rayn San Nicolas helped save two of his cousins on Saturday, before succumbing to the waves himself. The mother and a sister of the 14-year-old who drowned Saturday afternoon at Ritidian Point in Yigo are proud of the teen who, even in the face of danger, thought of helping others before himself. Rayn San Nicolas was the only one of four swimmers who didn’t make it back to shore after struggling in the waters off Ritidian during a family picnic Saturday afternoon. The other boys who were in the water talked about how Rayn San Nicolas saved them from being swept out, according to the San Nicolas family. “He was able to do that before he was swept away,” said the teen’s mother, Monica Flores San Nicolas, crying. The teen was an honor student, excelled in sports and volunteered at his church. He was about to start his freshman year in high school. On Saturday, rescue officials received a 911 call for distressed swimmers at 2:42 p.m., according to the Guam Fire Department. Four swimmers, one of whom was Rayn San Nicolas, were struggling in the water. The other three made it back to shore. 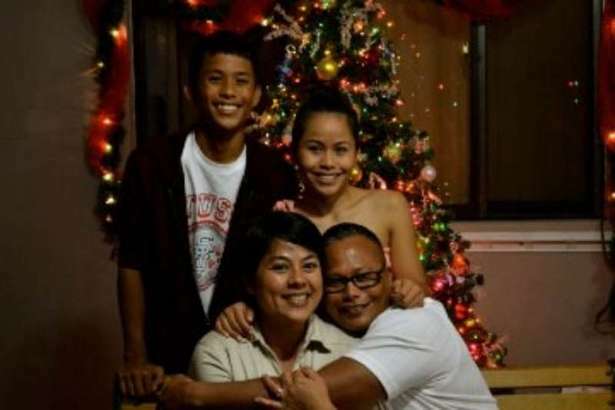 Rayn San Nicolas went missing in the rough waters at Ritidian Saturday. Divers found him almost two hours after a search-and-rescue operation began. He’s the seventh water-related death on Guam this year. Rosary services start today at St. Anthony’s Church in Tamuning. The teen was looking forward to starting high school in the fall at Father Duenas Memorial High School, with his 15th birthday just around the corner in September. He had just completed eighth-grade at St. Anthony Catholic School and left his mark there, according to his sister, Naomi San Nicolas. Monica San Nicolas said her son also played soccer for the Guam National Team and made Top 10 in the middle school All Island Cross Country Competition last school year. He also was active in the community, waking up early to handle the projector for the 6 a.m. Mass at St. Anthony Church. “He was such a compassionate person that he risked his own life for the lives of his cousins,” his older sister added.